This paneer kabab recipe is a vegetarian appetizer that will make your taste buds go in a tizzy with delight! 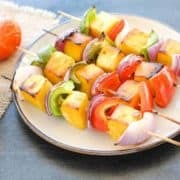 Soft cubes of Indian cottage cheese and vegetables are marinated, skewered and grilled to perfection in the oven. Mmm! Remove the layers of the onion and cut into squares. Cut the green and red bell peppers into squares. Take all the marinade ingredients in a bowl and whisk to form a smooth paste. Put the paneer pieces in the marinade, cover with plastic wrap and leave the bowl in a cool place for 30 minutes. Put all the chutney ingredients in a small blender and blend to get a smooth puree. Turn on the oven and preheat to 525 degrees Fahrenheit on the broil mode. Skewer the paneer and veggies on wooden skewers alternating between the paneer and veggies. Shake off excess marinade. Spray the kababs generously with cooking spray and arrange the skewers in a deep bowl so that the kebabs do not touch the bottom. Place this bowl in the pre-heated oven and set the timer anywhere between 5-8 minutes. After the timer has gone off, remove the bowl with the skewers and arrange them on a plate. Serve hot with green chutney. Paneer, chat masala and garam masala are all available in Indian stores or the international aisles of most supermarkets. Paprika can be substituted with red chilli powder if you want a spicier kababs. It’s a personal choice. If you want, you can marinate the veggies too before grilling them. Again, a personal choice.